Throughout the US presidential campaign of 2016, reporters Jonathan Allen and Amie Parnes spoke with numerous members of the Clinton campaign on the understanding that the conversations were off-the-record until after the campaign. 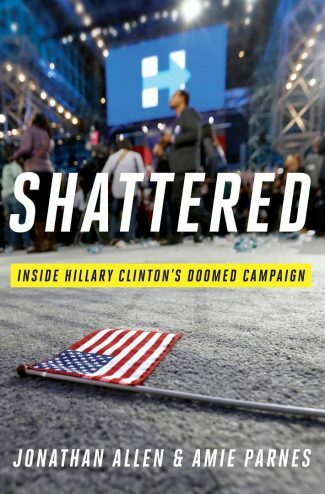 Now they have published a tell-all tale, Shattered: Inside Hillary Clinton’s Doomed Campaign. This is a book devoid of any understanding of the federal budget, credit and regulation, the federal leadership of the US and global economy and financial system and the integration of those power and financial flows with the campaign, the candidates and the policies they propose. This is a book written in a mythic universe – candidates compete based on speeches filled with conceptual ideas and clever phrases. Campaigns are a process in which the voters decide the outcome heavily influenced by an all powerful media – a form of entertainment. Allen and Parnes describe a campaign driven by data and analytics. The campaign leadership is lacking an understanding of reality on the ground – of people, what they feel or how they connect to each other. Politics is science, played like a video game, not a living, human art. With one exception – Bill Clinton understood what was wrong but the candidate and campaign leadership would not listen to him. Bill was not inside the cult of gender identity or the cult of data analytics. This is the useful aspect of the book – if you aspire to becoming a successful campaign manager, you will learn about the limits of data and analytics. In one sense Shattered tells a terrifying story. Hillary Clinton and her team really did not understand why she was not liked, not trusted and even hated by so many voters. They did not understand that when you use government to steal from people, to kill people and to get rich from doing so that they take offense. Put another way, Clinton and her group are so used to people not being able to connect the dots between their personal losses and political corruption, they cannot fathom that has changed. Indeed, most of the people working on the campaign could not connect those dots. Their ignorance of “how the money works” and their candidate’s real history is breathtaking. Are Members of the Washington Establishment Losing Their Minds? Post elections polls indicated that a strong majority of the country wanted Washington to go back to bi-partisan cooperation and work. Instead we are watching suicidal in fighting inside the Beltway, which is seriously compromising national security, handicapping the business of government, not to mention driving down the dollar and the US stock market. This is the logical extension of the story told by Allen & Parnes. The Washington establishment is a prisoner of a bubble created by the rich profits of debt, crime and war. As one reviewer said of Shattered, the Washington political establishment has lost the ability to explain itself or its motives to the people outside the Beltway. You don’t need to read Shattered to know this. You can read it every day in any national US newspaper. Or Are They Scared to Death? That may be true. However, I suspect the majority of federal officials are not afraid of the American people. They are afraid of the people who ordered an assassin to put a bullet in DNC staffer Seth Richard’s back during the Democratic primary last year. This is the governance question of the day. Which determines our leaders and policies – ballots or bullets? You will not find the question or the answer in Shattered.